During Monsoon, 400 tmcft of water from the Netravati fows into ocean, which can quench thirst of entire state. MODEL TO EMULATE? Marina Barrage Singapore provides water storage, flood control and recreation. It is a dam built at the confluence of five rivers, across the Marina Channel between Marina East and Marina South. Bengaluru water crisis', 'Karnataka faces severe scarcity', 'Drinking water crisis', 'Reservoir levels plunge' - These are the kinds of headlines that leap out at us everyday and if they are to be believed, the situation is dire. Inland reservoirs, rainwater harvesting, desalination and diversions from a remote are some of the most widely-touted solutions. Some are more feasible than others. It can hardly be argued that times like these call for the careful examination of every possible solution. Before we begin, however, let's take a look at the Central Water Commission data to understand where things really stand. About 400 tmcft of water from the Netravati river joins the ocean during the rainy season. Tapping just that one source can provide drinking water to all households in Karnataka. And India has more rivers than we can count and lot of water flows into ocean in four months of monsoon season! Clearly, the situation is nowhere near as bad as it is made out to be, we don't suffer from a water shortage, merely an inability to store it. According to the Central water Commission, nearly 78% of river water joins the ocean. Still, here we are, looking at a scarcity in drinking water! The Yettinahole project aims to tap into the Netravathi's resources, which will yield about 24 tmcft of water (claim) for diversion, at a cost of Rs 13,000 crore. Desalination hasn't convinced us either, largely because it is formidably expensive. It's not completely environmentally sound either - we're taking an 'x' amount of water from the ocean, using reverse osmosis/other technologies to extract pure to obtain drinking water and dumping highly concentrated salt content back into the ocean. Marine life will be decimated for about three-km around the outlet. Having said that, desalination is an option in countries like Saudi Arabia, where fresh water is not available. So then what? It would be unfair to say that India hasn't done anything to improve the situation. As it happens, we are one of the largest dam-building nations in the world - we have about 5000. Building more dams clearly isn't the answer, because it involves the displacement of a large number of people and also causes damage to environment and forests, all of which can be avoided. Then we have coastal reservoirs. They store water without disturbing people, harvests or natural habitat by replacing standing salt water by river flood fresh water. No land is occupied in their construction, they are built at the delta, where the river joins the ocean. All we're doing is shifting the gates from the coastline and placing them a little further into the ocean. The breakwater will stop sea water from entering past a certain point, creating fresh water reservoirs. Tapping a fraction of the Netravati's water alone will more than meet our demands. The main objection to this is that we will be using up the river's resources and causing widespread environmental damage. This is not true. Trapping a single tmcft of water means building a column that is 28.3 m high, in an area of 1 km by 1 km. We can build a column to store about 20 - 30 tmcft - the remainder of the 400 tmcft will join the ocean. We're not submerging land in water either, we're using land that was submerged in sea water and swapping it with fresh, clean water. In fact, new land emerges at the edges of coastal reservoir. 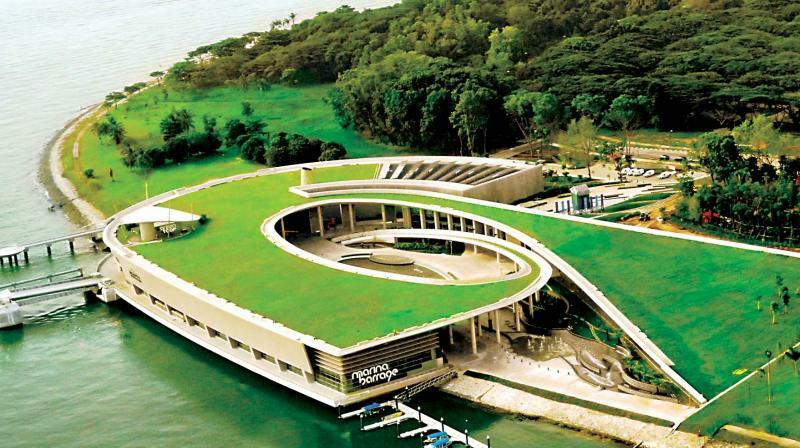 More than 10 coastal reservoirs exist across the world today, one of the most famous being the Marina Barrage in Singapore, which has received the best project award in Excellence in Environment Engineering. Korea, Netherlands and Hong Kong are other places where coastal reservoirs are successful. All it takes is tapping one river in each state for about 20-30 tmcft. If we calculate at the rate of 150 litres per person per day, the entire state of Karnataka requires around 90 tmcft of water per year. The state is already supplying a portion of this. We already have about 30-40tmcftft of drinking water stored and require only about 30-40 tmcft to have enough for everybody. There will be no more interstate disputes. We will be storing fresh, flood water, which is reasonably clean in coastal reservoirs. West flowing rivers are significantly less polluted than their east-flowing counterparts like the Cauvery and Krishna, which pass through highly-populated areas. West flowing rivers go through the Western Ghats, forests and small coastal towns with very small populations. The river catchment area will not be disturbed and its course will remain unaltered. All we're doing is building a dam at suitable locations in the shallow water of the ocean. Then there's cost. The cost of construction of coastal reservoirs is about Rs. 20,000 million per billion cubic metres. Inland reservoirs stand at Rs 100000 million, desalination at Rs 130000 million and recycling plants at Rs 120000 BCM. The total cost, inclusive of pumping water to Bengaluru is about Rs 12,000 to 15,000 crores (most of it for pumping). Providing a sustainable water solution means taking close stock of our natural resources and understanding how best to tap them. We can't build dams on land because there's no place to store the water they hold, waste water recycling/treatment plants are expensive and come with a certain taboo - this water will not be accepted for drinking purposes (needs a separate infrastructure to reach to individual houses) and desalination is both unnecessary and prohibitively expensive. The dismal statistics are being given to us by people with industry-interests, who want to push for desalination or treatment plants, when in reality, tapping a fraction of available resources will give us more than what we need. In short, India is not running out of water, water is running out of India! The writer is Professor, Civil Engineering, Indian Institute of Science. He is currently developing alternatives for desalination along with Professor Shuqing Yang from University of Wollongong, Australia.